Guy: “So, do you want a raisin?” Girl, “No.” Guy, “How about a date?" There are a gazillion different versions of these date and nut energy balls all over the internet. You can even buy them in bar form (hello, Larabar!). I've tasted my fair share of different fruit and nut combos over the years, but have always been a little unsatisfied; the texture was off or the ratio of dried fruit to nut was wonky (except the peanut butter and jelly Larabar-they perfected that one). So I rolled up my sleeves, dug out the food processor, and was determined to make my own perfect little bite. I love my Toasted Coconut and Almond Butter too much for that nutty combination not to be a starting point. From there I had to get the amount of dates right, balancing sweetness and texture. Too few dates led to a crumbly mess and too many resulted in a sweet and sticky web. I wanted to add cocoa to replicate a real chocolate truffle, but too much could be chalky and bitter and too little left my chocolate craving unsatisfied. Lots of trial and error later, and I leave you with this recipe, something I’m pretty darn happy with. It holds together just enough to roll into little balls, but doesn't compromise on any of the flavors. The little orb is perfect for eating plain or coating with a topping of choice. The only negative about this recipe is that it requires a food processor. Maybe a high-powered blender could work, but I haven’t tried it since it seems like you’d be stopping and scraping for ages. Please let me know if you do try it though. The mixture rolls best and sticks to the toppings when at room temperature, but they hold their shape best in the refrigerator or freezer. To up the chocolate ante, freeze them for a few hours, give them a dip in melted chocolate, sprinkle with toppings, and then return to the fridge until the chocolate sets. In a food processor, blend ¾ cup almond butter, coconut, dates, cocoa powder, coconut oil, and sea salt until smooth paste forms. Add remaining ¼ cup almond butter and pulse to combine. Using your hands, pinch off about 1 generous teaspoon of mixture and roll into balls. 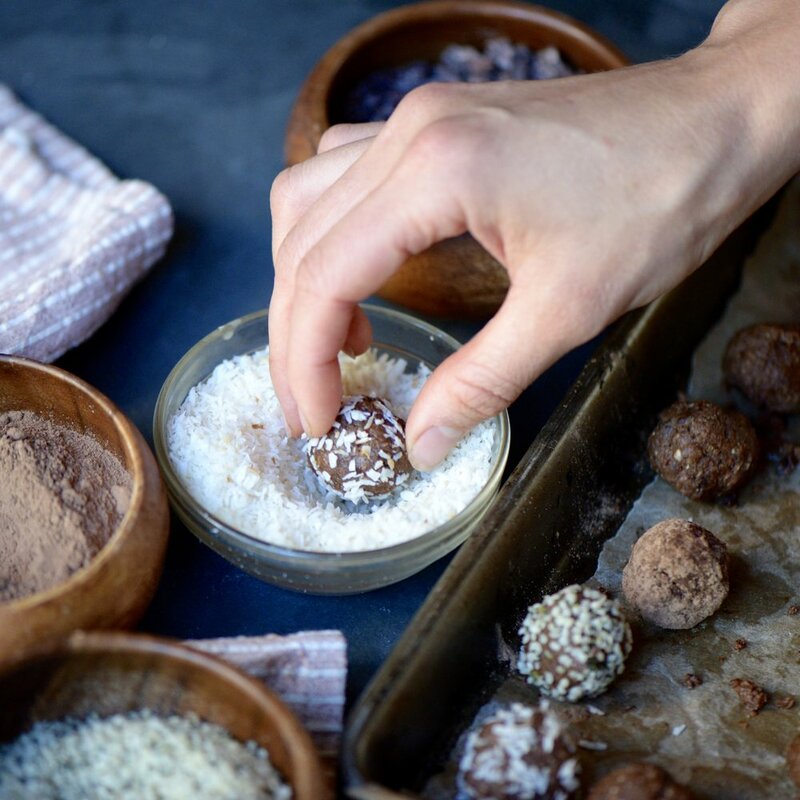 Roll balls into toppings of choice and store in the fridge or freezer. 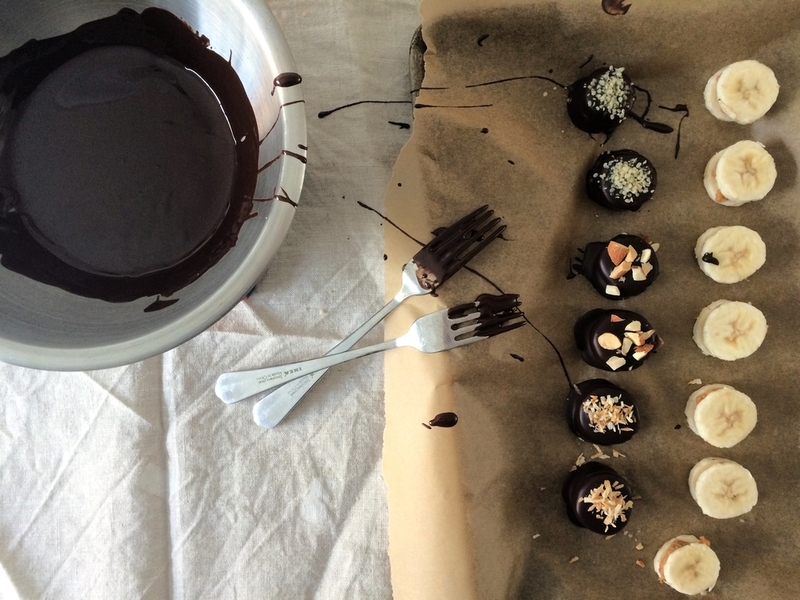 Makes approximately 60 truffles. This recipe has been satisfying all of my crunchy, nutty, chocolatey cravings as of late. I had thought of this recipe a while ago, but it wasn’t until last week when the mercury was cruising close to 100 that I actually executed it. It involves a few of my favorite ingredients, packaged neatly in a little sandwich, and stored in the freezer depths. At this point, I don’t blame you for thinking I’m describing an ice cream sandwich because that would be pretty awesome, too, but I’m describing something far more suited for my squirrel-like appetite. A mix of almond butter, tahini, cinnamon, and honey gets wedged between two seeded Mary’s Gone Crackers, dipped in melted chocolate, and sprinkled with sea salt and coconut. They are like a super-fancy, so-much-better-for-you, and heck-of-a-lot-much-more-delicious version of peanut butter Ritz bits. Yes, I compared them to Ritz bits. Superior Ritz bits. I’ll warn you that they are addicting-as in, I used a whole box worth of Mary’s Gone Crackers for sandwiches in just one week to keep up with the addiction. Then again, I have a nut and seed problem, so that may just be me. The freezer chill makes the crackers extra crispy, but not break-your-teeth crispy, and the nut butter mix stays just creamy enough to give a soft, gooey inside. The only downside to these is that they don’t travel well--at all. They are not like m&m’s; they will melt in your mouth AND your hand. Nut butter will ooze everywhere, and you’ll find chocolate fingerprints all over the place for days. Don’t say I didn’t tell you. Mix the almond butter, tahini, honey, and cinnamon in a small bowl until combined. Line a baking sheet with parchment paper. Assemble the sandwiches. Scoop ½ teaspoon of nut butter filling onto bottom side of 16 crackers. Top with another cracker of similar size, gently pressing down, and set on prepared baking sheet. Transfer baking sheet to freezer and freeze for 20 minutes to allow filling to stiffen. Meanwhile, melt chocolate in double boiler, or in microwave in 30 second intervals, stirring between each set. When the nut butter has set, remove pan from freezer. Working quickly, dip sandwiches halfway into melted chocolate. Return dipped sandwiches to parchment and sprinkle with coconut and sea salt (if using) while chocolate is still warm. Return to freezer and allow for chocolate to set, at least 20 minutes. Store in freezer and enjoy from there! Makes 16 sandwiches. One of my favorite things about Valentine's Day has always been seeing couples so smitten for one another. Something about the day puts people on their best behavior. I love seeing the guys with bouquets for their special someone, and the girls all dressed up on their way to a fancy prix fixe dinner. We used to do the whole fancy dinner thing when we first started dating, but we are much lower key now. I actually prefer our quiet night in, leisurely making dinner and lounging on the couch. My fiance also used to get me the most beautiful lilies on special occasions, but then we got a cat who eats anything that she should not have, like lilies, which happen to be poisonous to frisky felines. To be honest, I do sort of miss the flowers, but I can make the sacrifice if it means no vet visits. One thing that has stayed the same over the years is the extra consumption of chocolate on Valentine's Day. 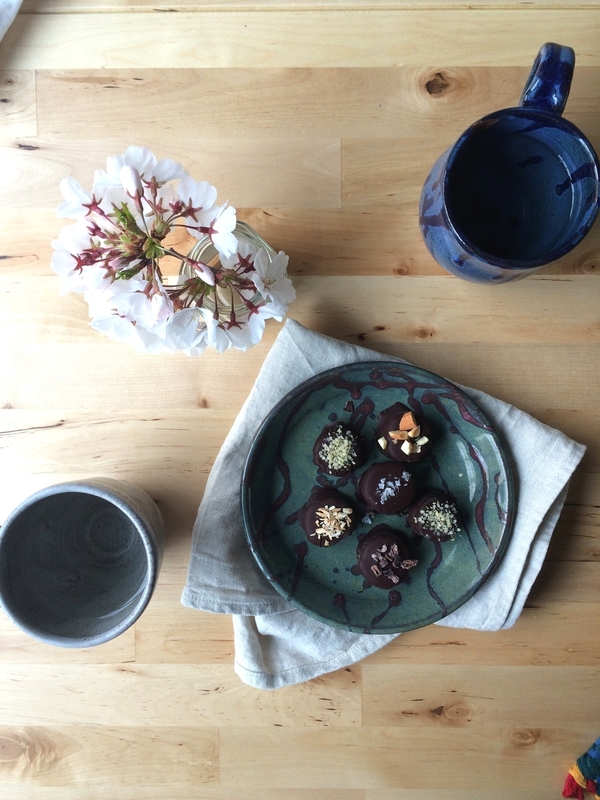 Chocolate for dessert is a given, but why not have chocolate for breakfast? These little cups are rich tasting, but still light on the belly. 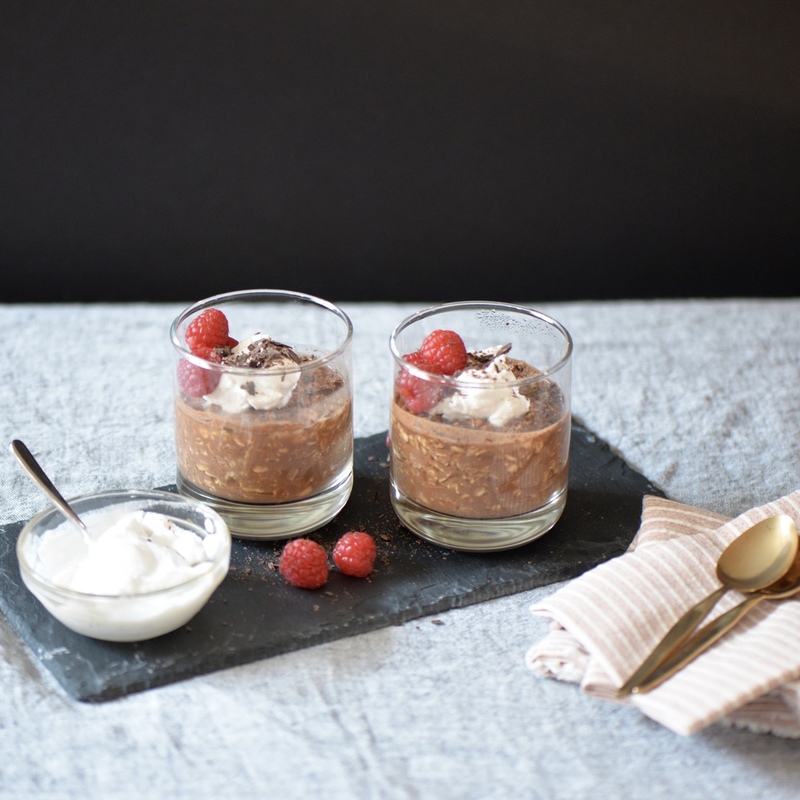 Nutty almond butter and rich cocoa powder make for a satisfying combo that tastes a bit like a brownie batter, and whipped coconut cream takes it to that extra special Valentine's Day level. If you have never made whipped cream with coconut milk, it is super simple. The hardest part is remembering to refrigerate the coconut milk overnight. Angela from Oh She Glows has a wonderful step-by-step tutorial for Coconut Whipped Cream if you need a visual. Considering the oats have to soak overnight anyway, I promise you cannot and will not miss that crucial first step. Do your sweetheart a favor- or yourself for that matter, and make this. Combine everything the night before, whip the coconut cream in the morning, and win major brownie points. Pun most definitely intended. Combine oatmeal with almond butter, almond milk, cocoa powder, honey or maple syrup, and pinch of salt. Mix well and allow to soak overnight. 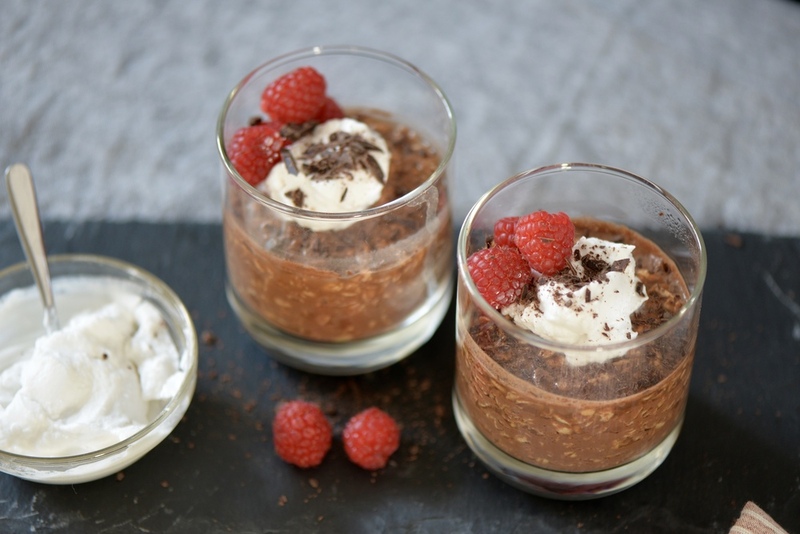 In the morning, divided into two portions, sprinkle with chocolate shavings, fresh raspberries, and a dollop of coconut whipped cream. Enjoy! Serves 2. Place can of coconut milk in refrigerator overnight. Scoop the thick cream from the top and add it to a medium bowl. The liquid left behind can be added to smoothies. Using an electric mixer, beat the coconut cream until fluffy and light, for about 2-3 minutes. Stir in honey or maple syrup. Store in fridge for up to 3 days. Re-whip as necessary. Now that it is finally getting warmer, I am craving frozen treats. I frequently find my older sister munching on these frozen chocolate covered bananas. Have you ever had them? The whole concept sounds totally delicious except for the fact that my sensitive front teeth cannot handle taking a bite out of the things. Way too cold. I had come across a recipe for smaller chocolate covered banana slices back in college, made them, and liked them, but I always felt that they could use a little oomph. Hence, these little bites. Now I thought I was pretty darn smart for coming up with these little sandwiches, but it turns out that there are already similar creations out there- or at least there is already a similar creation out there. I only found this out after starting to write this post, when I took a break to peruse Pinterest and behold, there was a version right there on my welcome page. So to celebrate great minds (and tummies) thinking alike, here is the link to that recipe. 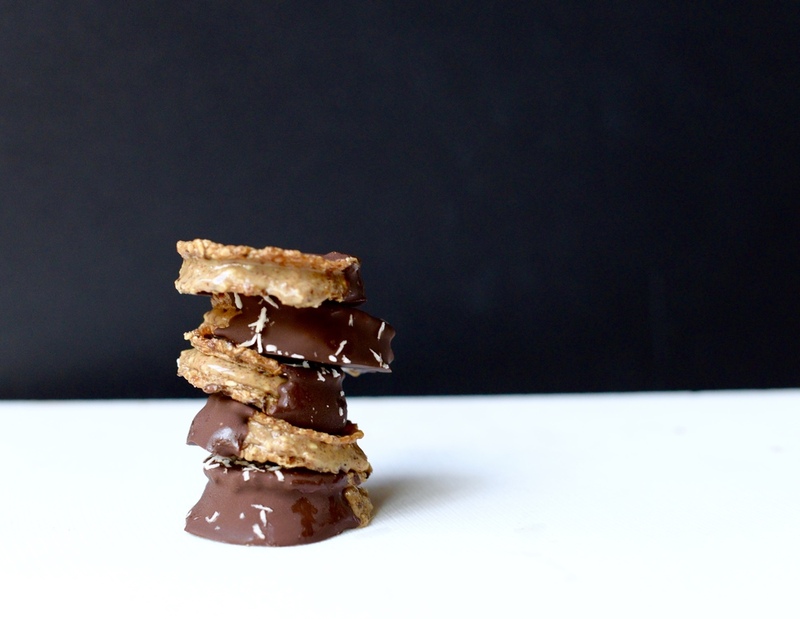 These little bites combine a few of my favorite things: bananas + nut butter + chocolate. This is essentially a template for a frozen banana sandwich, but you can really customize it to what you like. I used peanut butter and almond butter, but you could use sunflower seed butter, pecan butter, even coconut butter. Now that I am typing that, I think coconut butter would be really tasty...I melted a 70% dark chocolate for the coating, but if you prefer milk, do that instead! The beauty is that you really cannot mess this up. It is guaranteed that you will get a delicious result. These are a fantastic post-workout snack given that they will help you replenish your carbohydrates and supply you with protein. The bananas give you a little potassium, and if you top with hemp seeds, you get even more healthy fat. 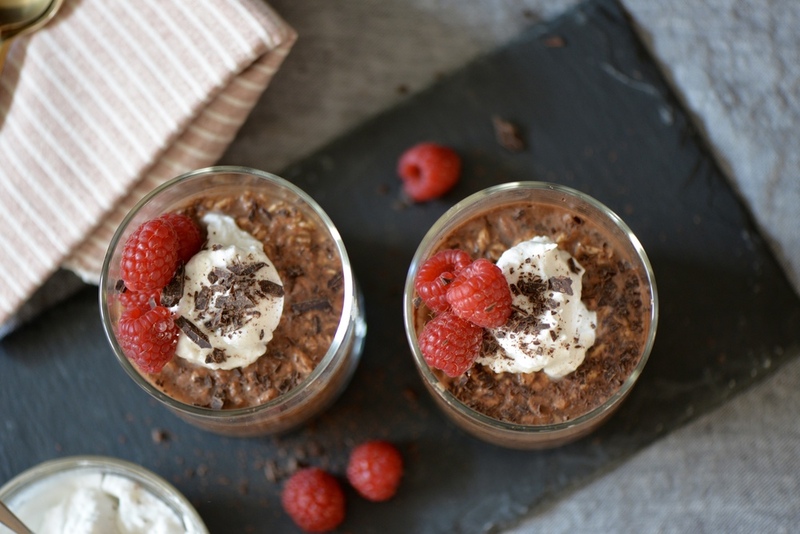 These can be made on the weekend to keep you fueled for your week ahead. Just grab a few from the freezer when you need a pick-me-up. Line a small baking sheet or a plate with parchment paper. 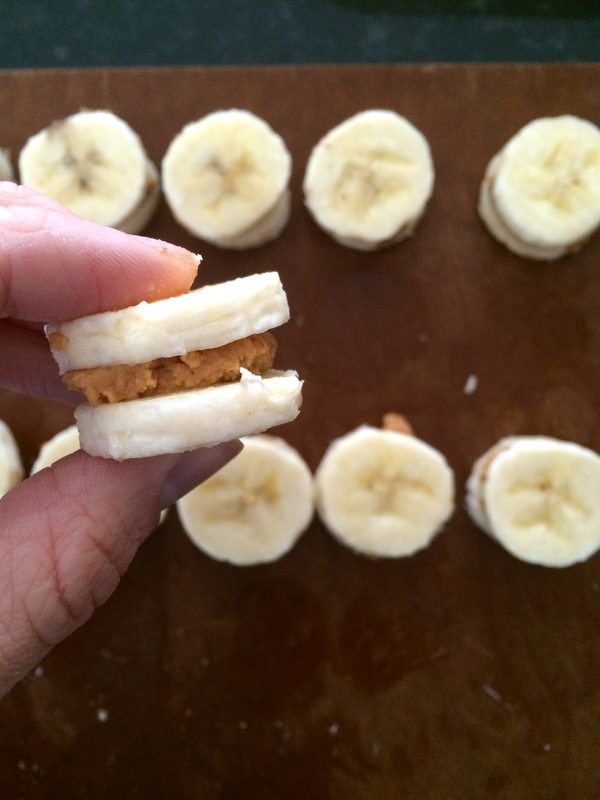 Place about 1/2 teaspoon of nut butter on one half of one banana slice and top with another slice, pressing down gently to create a banana- nut butter sandwich. Complete with the remaining bananas. Place the baking sheet in the freezer for about 1 hour for the sandwiches to firm up. Right before removing the sandwiches from the freezer, melt your chocolate. I used a double boiler method, placing the chocolate in a metal bowl over simmering water and stirring to melt, but you can also melt the chocolate in a microwave safe bowl in 20-30 second increments, stirring after each increment. Remove the chocolate from the heat once completely melted. Prepare your toppings if you choose to use them. Remove the banana sandwiches from the freezer. One at a time, dip the bananas in the melted chocolate, and use two forks to remove them, allowing the excess chocolate to drip off. Return to the parchment. The cold bananas will cause the chocolate to harden quickly, so be ready to sprinkle your topping of choice on top before the chocolate sets. Complete with the remaining banana sandwiches. Return to the freezer for at least 30 minutes so the chocolate can fully harden. Store in the freezer. My medium sized banana made 13 bites, but it depends on the size of your banana as to how many will be made and how much nut butter you will use.